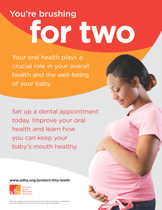 Maintaining good oral health during a woman’s pregnancy and her baby’s infancy is essential in setting little ones up for a lifetime of good health. 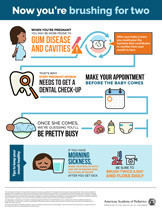 Funded by the Centers for Disease Control and Prevention, the American Academy of Pediatrics’ Protect Tiny Teeth campaign educates moms-to-be and new parents about their own oral health and the oral health of their children. 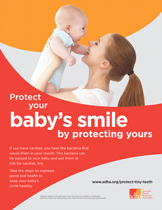 ADHA is excited to partner with the American Academy of Pediatrics on the Protect Tiny Teeth campaign by sharing our companion toolkit created for dental hygienists to use in parent education. 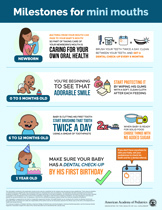 Protect Your Baby's Smile You're Brushing for Two Questions? 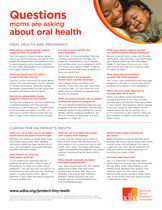 Tiny Teeth: Beneath the Gums from Healthy Children on Vimeo. Tiny Teeth: Art of For-Two’ing from Healthy Children on Vimeo. 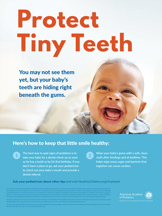 For more information about the Protect Tiny Teeth campaign, visit the American Academy of Pediatrics website".